In the last few months, we've posted videos of developers sharing how they built their applications with Google developer tools and technologies. These included developers building their AJAX front-ends with Google Web Toolkit, writing mobile apps for the Android platform, and scaling their web apps with App Engine. We really enjoyed working with these developers to produce these videos. However, we thought it would be great to allow any developer to create their own video talking about their application and help them share their video with other developers on code.google.com. Create a short video (or videos) based on the above guidelines and upload it to your YouTube account. Submit your video details on the submission page. 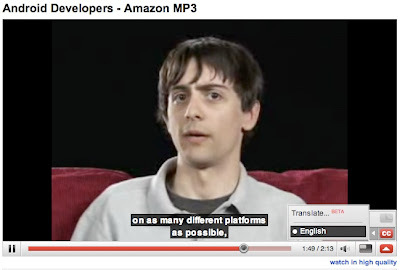 We'll be reviewing submissions regularly and selecting videos to feature on code.google.com and/or our developer blogs. Ready to tell us your story? Visit the submission page to get started. As the number of developers and projects have grown on Google Code, we've started thinking about how to get projects to learn from and work with each other. Today, we're happy to announce that we have made a few steps towards that goal. First, we've added user update streams to make it easy to see what a particular user has been doing across Project hosting on Google Code. As an example, take a look at Ben Collins-Sussman's activities on his profile page. Ben works on Google Code, but it's obvious that he has other interests as well. In addition, tracking open source projects and other developers is as easy as starring a project or a developer profile. Starring a project or developer adds a link in your new "Starred Projects" and "Starred Developers" section of your profile page, making it really easy to find those projects or developers again. Starred projects are also added to the new "My projects" drop-down, which makes it easy to navigate to a project from anywhere on the site. 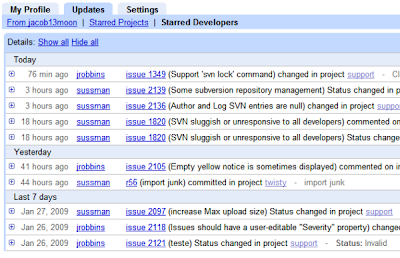 Once a project or a developer is starred, all updates from starred projects and developers can be tracked by looking at your personalized updates.